Notes from Two Scientific Psychologists: Why don't giraffes fall over more often? Why don't giraffes fall over more often? One of the major reasons psychologists think we have mental representations is to overcome delays in the nervous system. Information has to come from sensors such as the retina and travel the distance to the visual cortex. This takes time. That information must then be processed and combined with other information to generate adaptive responses. This takes time. Delays in a control system that relies on feedback are a big problem for stability. The more time it takes for feedback about how well you are doing to reach the brain, the less relevant that feedback information is - it's no longer about what you're doing right now. This makes it difficult to make sensible error corrections and it ups the chances that something will go badly wrong. A lot of people therefore claim that the only solution is prediction, and there's a strong research industry investigating how the nervous system predicts so well. There are, however, embodied solutions to delays in nervous systems. Prospective control is the strategy of controlling your behaviour using information about how events are unfolding over time. If you have information about this dynamic, then perceiving something at time t tells you something useful about what's happening at time t+delay and with a little calibration you're running in real time. There is a lot of evidence that this is a very common strategy; the evidence mostly comes from interception tasks, because identifying the dynamics and the information that dynamic might be producing is a tractable problem for psychologists. Prospective control isn't always an option though; sometimes there isn't information about what's going to happen next (for example, there's no information about upcoming changes in friction, which is what makes ice so dangerous). In addition, prospective control still requires information to get into and be processed by the nervous system, so delays might still be an issue. Motifs are a neural architectural solution to delays; the brain takes a little bit of time to set this organisation up but then runs with zero lag between widely spread networks modules.I don't yet know enough about these to know how widespread or effective a solution they are, however. Giraffes- why don't they fall over more often? One interesting model system for thinking about the consequences of neural delays is the giraffe. Adults giraffes stand 5-6m tall, so the feet are a long way from the brain. Anything that happens to the feet as they walk (say, tripping on a tree root) will potentially not be registered fast enough for the brain to issue a response. Do giraffes, in fact, fall over much? I've been poking around Google Scholar and Twitter with no luck; there just doesn't seem to be much research on giraffe locomotion. Alexander chased some in a car to get them up to top speed and do some biomechanical analysis (because he is awesome and unafraid of the obvious experiment; Alexander, Langman & Jayes, 2009) but I don't think any fell over. There's some work on the basic mechanics of giraffe locomotion, but there just isn't much information about how well the whole thing works. Their long legs are a fact, though, so why don't giraffes fall over often enough that people (not to mention evolution) notice it as a thing? One option is to invest in more and faster neurons. 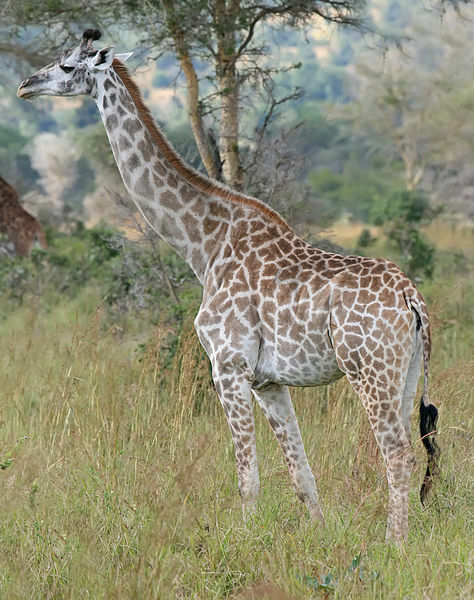 However, More et al (2013) measured the conduction velocities of 8 male giraffes and found that they have the expected number and the speeds averaged around 50m/s, fairly typical for mammals. Giraffes have not invested in this solution, suggesting that it either wasn't an option or they have another solution that works better. More et al don't have an alternative beyond falling back on prediction, though (this story featured on Quirks & Quarks a while ago, and it's what got me thinking about this topic). Their gait is a very typical quadruped lateral sequence gait (hindlimb comes up and followed right away by the forelimb on the same side (video; thanks for the help here, John Hutchinson). Do they have behavioural modifications to this? Do they perhaps only ever walk slowly, to give themselves time to cope with any problems? Typical walking seems to be quite chilled out (video) so that fits. But chilled out walking is pretty common in animals that don't have to be anywhere immediately (it conserves energy) and giraffes can run at 60km/h and sustain 50km/h for some distance (video; Wikipedia has some references). That video shows them turning and maneuvering quite well but in the open and not at full speed as they run through the trees. They do live in fairly well behaved terrain; flat grasslands. There isn't a lot to trip them, and they don't move at full speed when there is. But other than these fairly normal behaviours, giraffes don't seem to be doing anything in particular to cope with these neural delays. This suggests that the delays aren't actually a problem. Neural delays are potentially a problem for a wide variety of animals. One known solution is to offload responsibility for limb control onto the local limb dynamics. For example, arms are often arranged as low dimensional damped mass springs; this allows them to oscillate stably with minimal control requirements, and they respond to perturbations without explicit instructions. They simply do what nonlinear dynamical systems do and self-reorganise themselves back to where they were, if they can. This sort of solution is common and it works well (another example is the equilibium point control hypothesis, e.g. Feldman, 1986). Giraffes almost certainly do this kind of thing too. Another solution is to shorten the distance to the neural control circuitry. The main solution here is the spinal cord, which recent research has revealed to be a complex and very sophisticated piece of neural hardware and not just a waystation for signals heading to cortex. Another related idea (from Sabrina) for which I have no evidence: If a giraffe trips, where does the most relevant information come from? Are they built in a way that the information about a trip or perturbation is actually generated at, say, the hip? Cognitive science loves a good case study that demonstrates a point, and whatever the giraffe is doing to cope with the fact that it's brain is 5m away from it's feet will be a great demonstration of how to cope with neural delays. Prediction is always an option, but the data typically never favour it and it's an unstable solution for the same reason as delays are a problem: it's hard to make sure the prediction is about what actually happens. An embodied approach using our four research steps (Wilson & Golonka, 2013, pg. 2-3) can guide research here as readily as it can in psychology, and we would love to see biologists exploring this question comprehensively and without jumping straight to prediction as the only alternative. That they don't fall over is because of something that's a peeve to me. Scientists do not get it. The brain is not the mind. The brain is in the head but the mind is in the entire body. How often do giraffe calves fall down? Prey mammals learn to stand and run quickly, but fall a lot in the first hours after birth. Those falls and recoveries must function similarly to the more extended clumsy learning to walk of slower developing mammals. Maybe could learn whether mechanisms for early locomotion generalize across these types, which include equids, camelids, bovids, cervids, etc. All are sure-footed as adults, whether large or small, and that's based on both a diagonal type of gait (trot) or lateral gait (pace.) "Something" happens to the signaling of "uncertain terrain) in the change from barely-managing newborn infant to older young (often only a few hours older, certainly within the first week of life) that makes them able to handle their legs without crashing. Excellent blog. I've only made a superficial skim so far but it is already clear to me that I've come to the right place. I've been doing a lot or research recently about representation and imagination and my conclusions align very closely with yours. Although I work in quite a different field I think I can point you in the right direction to establish exactly what representations actually are and how they can only ever be publicly perceptible things. I've got a lot to share and ask but for the moment perhaps I'll just hold back my enthusiasm and simply that I'm looking forward to delving a lot deeper into what you have here. Well, don't forget, giraffes also have a long way to fall, so there's lots more time to take corrective action. Interesting blog! I'm a computational neuroscientist, so we use the word representation a lot. Only after talking to philosophers did I realize that the word carries a lot of mental/cognitive baggage! Of course comp neuro people are happy to dump the word and replace it with "mapping" in the mathematical sense. I find the idea of direct realism hard to comprehend, but I'd like to understand it better. How does a non-representationalist deal with memory? When I am thinking about something that is not in the environment, am I not representing in the literal sense of re-presenting? When I recall a phone number, isn't it easy to think that the number has been represented? Pattern recognition is also an area where talk of representation seems to have an instrumental role. For instance, humans are extremely good at rotation-, scale-, translation-, and illumination-invariant visual pattern recognition. How does one account for this faculty without the notion of a transformation-invariant template, representation or mapping? A few thoughts. Four legged locomotion is intrinsically far more stable than bipedalism and therefore the probability of a quadruped falling over must be greatly reduced. Having the processing unit immediately adjacent to any balance detection is also likely to be greatly advantageous as is having the balance sense located where it is likely to register the greatest perturbations (i.e. at the top). If the lower limbs are crucial to the maintenance and fine adjustment of balance then the question is raised as to the relative ease – even for us bipeds - of walking on stilts (though I'm not sure how a giraffe would manage on stilts). I’m sure the structure of the giraffe’s body plays an important part in enabling them to perform 'intelligently', as you are arguing, but perhaps one way to research the ability of upright animals to maintain their balance without the assistance of immediate updates from the brain would be to find out about the behaviour of animals when their heads are suddenly removed. Headless chickens come to mind. Apologies for the slightly macabre turn. Reading your first paragraph, it occurs it me that the standing-giraffe problem might have some interesting overlap with the contracting lobster problem. It is very possible that a gangly quadrupedal animal will have tens of thousands of firing patterns that can rescue it from any typical perturbation in walking pattern. Could be; perturbations to locomotion only come in a few flavours. The issue of when to initiate which one still remains, though, so time is still a factor. Actually, it just occurred to me that error correction is an affordance problem. Affordances help constrain the space of possible actions to a space of ones that are most stable; this helps action selection (I really must blog the talk where I argue this). Error correction involves choosing the right correction to make; I wonder if there's a sensible 'affordances of perturbations' analysis lurking here somewhere. (1) Like other vertebrates locomotion is generated by mechanisms within the spinal cord that take care of the details of limb control. The brain doesn't need to do the work, so the delays associated with signals traveling down the neck aren't necessarily a big deal. In short, I don't think the problem is really a giraffe problem - they don't have locomotor control delay issues any more problematic than faced by a cow or a horse. An elephant could be different. Is embodied cognition a "no brainer"?